The southerly winds that are being generated by the shifting energy patterns of the warming Northern Hemisphere are not only bringing us our spring rains, they are also driving the wind assisted arrival of dozens of species of birds that have spent the long winter months in the warmth and shelter of the America tropics. From the cloud forests of the eastern slopes of the Andes to the rain forests of the Amazon basin, tropical birds, riding these prevailing winds, make the 3600 mile journey from South America to Western Pennsylvania. Our first tropical arrival was in our front yard a few days ago. 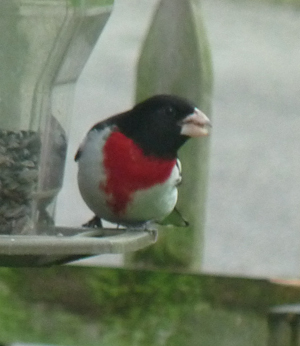 A male, rose-breasted grosbeak was busily cracking and swallowing seeds (photo at left). He had just flown in from Venezuela (or Columbia, Ecuador, or Peru) and undoubtedly needed to recharge his metabolism! We have had a mating pair of grosbeaks near our house for the past three years, but it is impossible to know for sure if this is the same male. We like to think, though, that he has returned and that his more plainly feathered mate is right behind him. The next tropical species we encountered was a Baltimore oriole. The distinctive orange and black oriole male was perched in a large poplar tree at the start of the Roaring Run trail in Apollo. Several other orioles showed up this past weekend in the wooded edges of the field near my house. The males are vying with each other for prime breeding territories and are getting ready for the imminent arrival of the females. Baltimore orioles (and this species is distinct from Bullock’s oriole so recent attempts to lump both species together as the “northern oriole” are not valid) spend their winters in southern Mexico and Central America and then in the spring spread themselves out across their breeding territories in the United States from North Dakota to Maine and Oklahoma to the Carolinas. Right after we encountered the oriole we saw flashes of intense red streaking through the canopy of a tall silver maple tree. The scarlet tanager males had also arrived and, like the orioles, were vigorously singing and challenging each other for the best breeding territories. Henry Thoreau wrote in his journal (and was quoted in a 1862 R. W. Emerson article in “The Atlantic Monthly”) that a scarlet tanager “..flies through the green foliage as if it would ignite the leaves.” The small, pale green leaves of the silver maple did seem under some thermal stress by the whirling tanagers. Several other people noticed the tanagers’ arrival this week, too. Bud Gibbons and Maria Franco de Gomez both experienced red flashes in front of their cars and were stunned by the intensity of the colors. Tanagers over-winter deep in the mid-altitude forests and lower rain forests of western South America (as far south as Peru and Bolivia). In the spring, they follow the leaf emergence of the North American deciduous forests northward and can breed and nest well into southern Canada. They need large blocks of continuous forest in order to thrive and reproduce. Their tendency to both nest and hunt for their insect foods high up in the canopy makes this species, in spite of the brilliant colors of the males, difficult to see except during this brief, male competition period of late April and early May. Just above the “tanager tree” I saw (and heard) a small flock of chimney swifts swirling about as they searched for flying insects. The swifts were formerly called the “American swifts” when they lived in large, partially rotting, hollowed out trees prior to European settlement of North America. Land clearing and home and eventually factory building resulted in extensive loss of old, swift-ready trees, but generated extensive chimney construction. The swifts then took to chimneys quite readily for their summer nesting sites. Chimney swifts spend their winters in Peru in the forests of the eastern slopes of the Andes. I can picture them flying up and around the ruins of Machu Picchu and down into the dense cloud forests of the great river basins that drain into the Amazon gorging on exotic, tropical insects. I hope that our Western Pennsylvania scenery (and diet) aren’t too boring for them! Looking down from the sky-high swifts, in the brush just below the “tanager tree,” I saw streaks of yellow flashing up through the dense dark green of the multifora rose thicket. This blur of feathers finally landed and came clearly into focus. It was a myrtle warbler (actually several myrtle warblers). Also called the “yellow-rumped warbler” this hearty, little bird is capable of over-wintering as far north as New Brunswick and all around the Great Lakes. As long as it has its preferred food (wax myrtle and bayberry berries) it can survive even the harshest winters. Most of these individuals, though, winter in the milder climes of the southern U.S., Mexico, and Central America down to Panama (which marks the southern limit of their berry plants!). They are one of the few animals that can digest wax! Pennsylvania is on the southern border of their breeding territory. Finally, and there is really no “finally” to this story because there will be so many more bird species winging in from the tropics over the coming days and weeks, as we walked a bit further along the Roaring Run trail we were serenaded by the distinctive fluting songs of the wood thrush. We heard wood thrushes on every one of our Baker Trail hikes last summer. Their airy, rolling songs fill and define the deep, shady spaces of the woods. The individuals serenading us were the males which, like the orioles and tanagers, had recently arrived from their winter habitats of Southern Mexico and Central America. Like their oriole and tanager counterparts, these males are singing, and jostling for territory in anticipation of the arrival of the flocks of females, and the females are possibly only a few days away!